To Storanger on the "Ships starting with S" page. Delivered in June-1930 from Rob. Duncan & Co. Ltd, Port Glasgow, 9223 gt, 14 505 tdwt, 473.6' x 64.3' x 36.6', 2x 6 cyl. 4T 4000 ihp, 11 knots. Aug. 26 Milford Haven   OB 204 For Capetown. March 10 Capetown Freetown  Independent Page 1 gives departure March 12, arrival March 26. May 6 Swansea Milford Haven  Independent Page 1 gives arrival May 7. May 14 Milford Haven   OG 62 Detached May 20. Aug. 20 Liverpool   ON 9 For Curacao. Dispersed 54 51N 20 42W, Aug. 25. Jan. 24 Bandar Abbas   PB 23 For Sydney, NSW. Febr. 28* Detached from PB 23 Melbourne Febr. 25 Independent *Should be Jan. 28. Dec. 17 Colombo   MB 58 For Abadan. Apr. 8 Gibraltar Chesapeake Bay Apr. 26 GUS 82 Gibraltar to USA. According to a posting to my Ship Forum (by Roland Berr), U-26 sighted Storanger at 09:30 on Nov. 4-1939 in square CG 46. The boat dived at 09:45 and started to follow the tanker, surfacing nearby at 11:00 and stopped her for a control. She was in ballast en route from Rotterdam to Suez at the time and was released again arround 12:00. Roland says, "As U-26 operated without MQ-charts on this mission there are very poor positions given. In this case we have just the so called Mittagsbesteck (position at noon) that shows 39°15'N - 11°35'W. This would be square CG 4633". (For info, Roland has collected a lot of KTB's, which can be reached through this external page). The boat's commander at that time was Klaus Ewerth - ref. external link at the end of this page. This U-boat, but with a different commander, was responsible for the attacks on Nidarholm, Steinstad and Belmoira in 1940 - follow the links for details. From Page 1 of the archive documents, we learn that she was on her way from Genoa to Curacao (via Trinidad) when war broke out in Norway on Apr. 9-1940; she had left Genoa on Apr. 8. From Curacao, where she had arrived May 15, she proceeded to Aruba then on to Bermuda, and on May 31 she can be found among the ships in the Bermuda portion of Convoy HX 47 (the Norwegian Italia and others were sunk; follow the links for details). Storanger's destination is given as Brest; she arrived Falmouth on June 19, Swansea on the 21st, and it looks like she subsequently remained there for 2 months. She later appears in Convoy OB 204, which originated in Liverpool on Aug. 26 and dispersed on the 29th, Storanger arriving Cape Town on Sept. 26 - ref. external link provided within the Voyage Record above; Hada County and Thyra are also listed. The next day, Storanger continued to Abadan - her subsequent voyages are shown on the archive document (as can be seen, she had long stay in Cape Town at the end of that year). In the spring of 1941 she's listed, along with Andrea Brøvig (for Gibraltar), Egda and Para, in Convoy SL 70, which left Freetown on March 29 and arrived Liverpool on Apr. 23; Storanger stopped at Belfast Lough that day before continuing to Swansea, where she arrived Apr. 25. Again, see the external link provided in the table above for more convoy information; another section of the same site has also included Gudvin, Lisbeth and Ravnefjell in this convoy, and says that Dagfred was scheduled but did not sail. (All 4 of them actually sailed in the next convoy, SL 71). 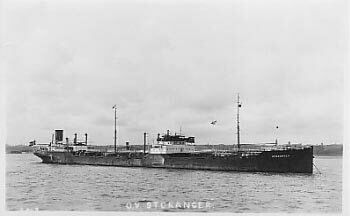 Storanger received minor damages during an air attack in Milford Haven on May 7-1941. Going back to Page 1, we see that she had arrived there from Swansea that same day. 1 man was injured. Later that month, she's listed in Convoy OG 62*, originating in Liverpool on May 15. This was a Gibraltar bound convoy, which arrived there on May 29; her destination is not given, but from the archive document we learn that she arrived Aruba on June 5 (having started out from Milford Haven on May 14). According to A. Hague, she had been detached from the convoy on May 20. OG 62 will be added to an individual page in my Convoys section; but for now, the ships sailing in it are named on the page listing ships in all OG convoys - Atle Jarl, Chr. Knudsen and Rolf Jarl are among them. From Aruba, Storanger proceeded to Freetown the next day, later returning to Aruba then made a voyage to Las Piedras, before heading to Halifax, and Arnold Hague now has her in Convoy HX 141, departing Halifax on July 27, arriving Liverpool Aug. 11. She had a cargo of crude oil and fuel oil, and sailed in station 82. She now joined the westbound North Atlantic Convoy ON 9, leaving Liverpool on Aug. 20-1941 (Inger was sunk; follow the link for more info). Storanger's destination is given as Curacao, where she arrived on Sept. 10, the convoy having been dispersed on Aug. 25. Having made a stop at Aruba, she proceeded to Halifax in order to join Convoy HX 152 on Sept. 28, along with Drammensfjord (station 106), Beth (44), Evita (93 - returned), Trondheim (95), Salamis (84) and Høegh Giant (92). Storanger stopped at Belfast Lough before proceeding to Swansea, with arrival Oct. 15. Her voyages in this period are shown on Page 2, and it'll be noticed that she subsequently had a long stay at Barry. She later went back across the Atlantic in Convoy ON 40, which originated in Liverpool on Nov. 25 and dispersed Dec. 4. Storanger's destination is given as Baytown; according to the archive document, she arrived Galveston on Dec. 20. This convoy will also be added to an individual page in my Convoys section, along with more information on it - in the meantime, the ships sailing in it are named in the section listing ships in all ON convoys. Arthur W. Sewall, Charles Racine (returned following a collision), Egda, Evita, Fernmoor, Finnanger (returned), Rio Novo, Slemdal, Tai Shan and Velox are also included. Her subsequent voyages are shown on Page 2, Page 3 and Page 4 (to Apr.-1946). Convoy information for some of these can be found in the Voyage Record. As can be seen, there are several long gaps in her voyages. For instance, she spent a long time in Colombo in 1942. 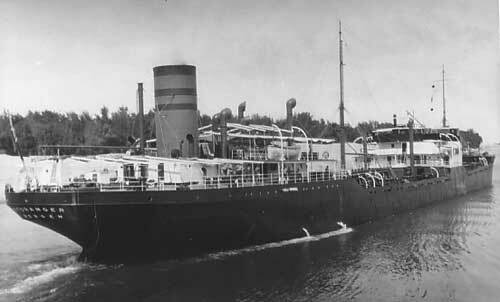 She had arrived there from Abadan on March 13; departure is given as May 26. She also spent several months in Fremantle, where she had arrived June 25. She did not leave again until Dec. 19. A. Hague says this was due to engine defects. Another long gap is shown in 1943. She had arrived Los Angeles on Apr. 23 and did not leave until Sept. 6. At the beginning of 1944, she spent several weeks in Fremantle again, and at the end of that year she was in Sydney for over a month. For more information on the Norwegian ships mentioned here, see the alphabet index at the bottom of this page, or go to the Master Ship Index. Sold in Febr.-1957 to Calibris Nav. Co., Liberia, and renamed Calibris (Liberian flag). Sold April 1959 to Eckhardt & Co. GmbH and arrived at Hamburg on May 17-1959 to be broken up. U-26 - This shows that the commander of this U-boat when Storanger was stopped in Nov.-1939 was Klaus Ewerth. Back to Storanger on the "Ships starting with S" page. Westfal-Larsen later had another ship by this name, delivered in Jan.-1960 from Rosenberg Mek. Verksted, Stavanger, 20 417 gt. Sold to Cyprus (Astir Nav. Co. Ltd., Famagusta) in May-1969, renamed Anson. Sold in 1980 to International Shipholding S.A., Panama, renamed Coral George. Sold again that same year to Everest Oil Pte. Ltd., Panama, renamed Celeste. Sold in 1981 to Helsal Product Carriers S.A., Panama, renamed Jaya Mulio. Sold for breaking up in Taiwan 1983. The text on this page was compiled with the help of: "Nortraships flåte", J. R. Hegland, Westfal-Larsen fleet list, E-mails from R. W. Jordan and misc. (ref. My sources).